You can use FogBugz for both internal e-mail (within your team) and external e-mail (with customers). I'll look at both of these aspects of the FogBugz e-mail system in turn. FogBugz uses e-mail for team members in two ways. First, some bug notifications are automatically mailed to the appropriate team members. Second, you can decide that you're a glutton for punishment and sign up for even more e-mail if you want to. FogBugz will automatically send you e-mail about your cases. This means two things. 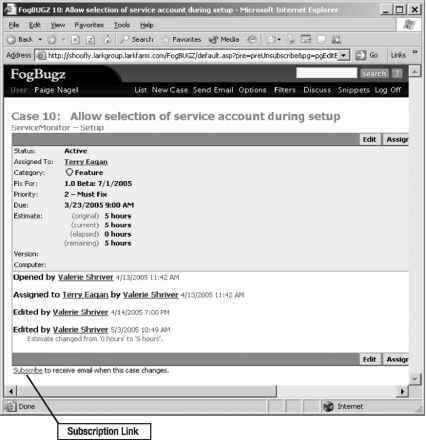 First, if someone assigns a case to you, you'll get the e-mail shown in Figure 5-1. Second, if someone edits a case that's already assigned to you, you'll get the e-mail shown in Figure 5-2. 'here are properties in the MSI for this, aren't there? f you do not want to receive automatic notifications from DgBugz anymore, change your preferences in the Options sreen. 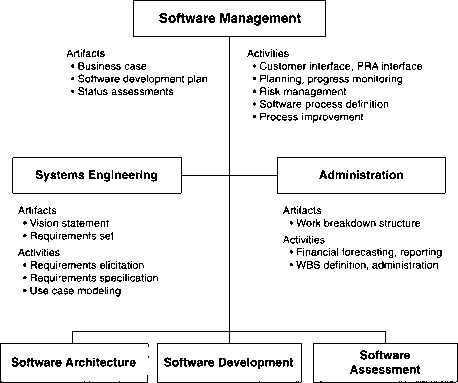 Paige, we already had to tackle this for HTMLInspector, so ping me if you need a crash course. If you do not want to receive automatic notifications from FogBugz anymore, change your preferences in the Options screen. In other words, FogBugz knows which cases you "own" and keeps you up to date on them (but it's smart enough not to e-mail you if you're the one making the change). If you feel these e-mail notifications are too intrusive, you can turn them off for yourself by selecting Options on the main menu bar in FogBugz. Turn e-mail notifications off as shown in Figure 5-3 and click OK.
■Caution It's not a great idea to turn off e-mail notifications. If you do so, you won't know when a new case has been assigned to you. I recommend you only turn notifications off if you already spend so much time in FogBugz that you won't miss changes anyhow, or if you're setting up a virtual account that doesn't correspond to a real human being. For example, you might want a FogBugz account where you can park cases that are intended for a new intern that you haven't hired yet. In that case, go ahead and turn off e-mail—but don't forget to turn it back on again! On the other hand, perhaps you don't feel like you're getting enough mail. Never fear, if you're bored and lonely, FogBugz can help! At the very bottom of any case, you'll find a hyperlink to subscribe to the case, as shown in Figure 5-4. Click the link and FogBugz will add you to the list of users to be notified by e-mail whenever anyone changes the case at all. You'll get e-mails similar to the one that you saw in Figure 5-2, just as if you were the owner of the case. When you visit a subscribed case in your browser, you'll see that the link changes to Unsubscribe to let you remove yourself from the notification list easily. Every e-mail also contains an unsubscription link. In the interest of reducing the amount of unwanted e-mail, FogBugz does not let you force-subscribe someone else to a case. If you want them to know about it, you should temporarily assign the case to them with a note like "FYI" and then immediately assign it back to whomever it really belongs. Before signing up for e-mail notifications, you should also consider the alternatives. First, because FogBugz changes the link to a case whenever anything changes about the case, you can monitor an entire list of cases simply by setting up an appropriate filter. Any cases that have changed in any way will be displayed with the unvisited link color (usually blue) in your browser. The other alternative is to subscribe to a case using RSS. You can subscribe to all of the cases in a filter or to a single case by using RSS. For details on this technique, see the section "Using RSS Feeds" in Chapter 4.